This page has been designed so you can print out a single sheet of paper some basic information about our stock bags. This may be very useful when you may have found this information on the web and these bags would be of use to your company or organization. Many times a person will have to take the information they found and present it to a third, fourth or however many people/departments for final approval. 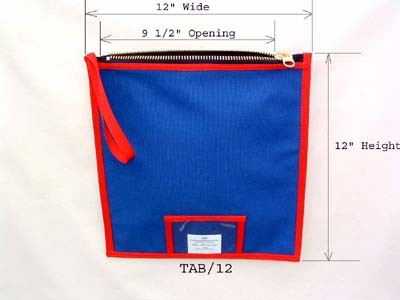 The bag below is a TAB/12. It measures approximately 12 inches wide by 12 inches high. There are three other stock bags, which are 6, 8, and 18 inches high. You can also choose any of these bags and increase the width by 3 or 5 inches which would make the bags finish at 15 inches and 17 inches wide respectively. These bags also have a clear plastic window sewn on the front seen here that you can slide in a paper card for identification. We can change the height to ANY height you may need. You have hundreds of color combinations to choose from. TAB/18 - $13.50ea., TAB/12 - $12.50ea., TAB/8 - $11.50ea., TAB/6 - $10.50ea.